The Alaska Volcano Observatory (AVO), a cooperative program of the U.S. Geological Survey, the Geophysical Institute of the University of Alaska Fairbanks, and the Alaska Division of Geological and Geophysical Surveys, has maintained seismic monitoring networks at potentially active volcanoes in Alaska since 1988 (Power and others, 1993; Jolly and others, 1996; Jolly and others, 2001). The primary objectives of this program are the seismic surveillance of active, potentially hazardous, Alaskan volcanoes and the investigation of seismic processes associated with active volcanism. This catalog reflects the status and evolution of the seismic monitoring program, and presents the basic seismic data for the time period January 1, 2000, through December 31, 2001. For an interpretation of these data and previously recorded data, the reader should refer to several recent articles on volcano related seismicity on Alaskan volcanoes in Appendix G.
The AVO seismic network was used to monitor twenty-three volcanoes in real time in 2000-2001. These include Mount Wrangell, Mount Spurr, Redoubt Volcano, Iliamna Volcano, Augustine Volcano, Katmai Volcanic Group (Snowy Mountain, Mount Griggs, Mount Katmai, Novarupta, Trident Volcano, Mount Mageik, Mount Martin), Aniakchak Crater, Pavlof Volcano, Mount Dutton, Isanotski Peaks, Shishaldin Volcano, Fisher Caldera, Westdahl Peak, Akutan Peak, Makushin Volcano, Great Sitkin Volcano, and Kanaga Volcano (Figure 1). AVO located 1551 and 1428 earthquakes in 2000 and 2001, respectively, on and around these volcanoes. Highlights of the catalog period (Table 1) include: volcanogenic seismic swarms at Shishaldin Volcano between January and February 2000 and between May and June 2000; an eruption at Mount Cleveland between February and May 2001; episodes of possible tremor at Makushin Volcano starting March 2001 and continuing through 2001, and two earthquake swarms at Great Sitkin Volcano in 2001. This catalog includes: (1) earthquake origin times, hypocenters, and magnitudes with summary statistics describing the earthquake location quality; (2) a description of instruments deployed in the field and their locations; (3) a description of earthquake detection, recording, analysis, and data archival systems; (4) station parameters and velocity models used for earthquake locations; (5) a summary of daily station usage throughout the catalog period; and (6) all HYPOELLIPSE files used to determine the earthquake locations presented in this report. Please note that all figure captions and figures as well as several appendixes have been removed from this version. This is an electronic copy of Appendix F that contains monthly plots showing station usage per day for each station in each sub-network operated by the Alaska Volcano Observatory (AVO). 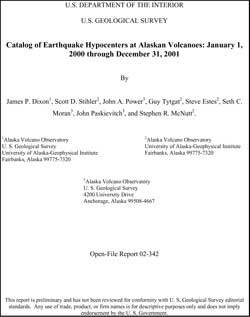 Dixon, James P., Stihler, Scott D., Power, John A., Tytgat, Guy, Estes, Steve, Moran, Seth C., Paskievitch, John, McNutt, Stephen R., 2002, Catalog of Earthquake Hypocenters at Alaskan Volcanoes: January 1, 2000 through December 31, 2001: U.S. Geological Survey Open-File Report 02-342, 56 pp., https://pubs.usgs.gov/of/2002/0342/.